Having trouble cleaning tiny spaces in between objects? Are you tired of having dirty equipment? THis ACS B861 7 1/4" Scrubble toothbrush style utility brush will solve your cleaning issues! It is the perfect size and features a narrow profile that cleans tight kitchen spaces. Boasting 1/2" nylon bristles, this general cleaning tool can even clean grout around ceramic tile. It is also useful when you need to clean off equipment and appliances, as this brush is small enough to fit within tight confines. With a durable plastic handle, this brush will keep up with your cleaning needs. The ACS B861 7 1/4" Scrubble Toothbrush Style Utility Brush with Nylon Bristles is an inexpensive solution for scrubbing the hard to get to areas. Also works good for teeth if you forget to brush them in the morning. (Not recommended for brushing teeth). This brush works great for cleaning hard to reach corners. It is comfortable to use and is holding up well. If your using a old toothbrush this is definitely work the upgrade. This is a great little brush. It is good quality and made to last. It's small and makes hard to clean areas a little easier to tackle. I use this brush to clean off parts of my pasta machine and food mixer. It does an ok job. I wish the bristles were a bit more stiff as they struggle to get dry dough off of equipment. This is a basic nylon bristle scrub brush. It has finger grips for ease of use and plastic bristles to scrub without scratching most surfaces. These utility brushes are truly universal in nature and the number of purposes it can be used for is numerous. It’s light weight and extremely versatile. We used to use larger HDX scrub brushes and old tooth brushes for cleaning window tracts & sills. That was until we ordered these bad boys. They are the perfect size and price and have great durability even when used heavily. Excellent product at an excellent price. A nice quality toothbrush style scrubber that is great for getting into hard to reach places. A great tool to clean behind the faucets. Really sturdy and does a great job. This brush is perfect for hard to reach areas. I like to wash my bottles and cups with it so I ensure they properly get cleaned. This is your basic nylon toothbrush for scrubbing at first glance. Once you hold it, you'll notice that ti has several upgrades to the basic design. The angled head, finger grips, and heavy duty bristles all set it above a more basic design. This utility brush is great for reaching narrow nooks and crannies in your house that could use a good scrubbing. There's a narrow gap behind my toilet that's impossible to reach without this brush. The scurbble toothbrush style utility brush is great for cleaning in small and tight fitting areas. It is perfect for cleaning around faucets and sink drains. I absolutely love using this brush. This gets in all the hard to reach places around faucets and fixtures and cleans wonderfully. I highly recommend ordering these! Use this brush for almost any detail cleaning. It's like a giant toothbrush. I use it to clean utensils. Works great for scraping food between the fork tines! This toothbrush style utility brush can be used for a variety of cleaning applications. It works great for grout in between tiles, dirty dish pits, scrubbing caked on food off baking sheets, and even for dirty bathrooms. This brush has nylon bristles. If you are looking for a super heavy duty brush we would suggest getting a brush with stainless steel bristles. The Scrubble Toothbrush Style Utility Brush with Nylon Bristles is a tough little brush; using it primarily to clean the undersides of thermal coffee container tops. This works well, it's essentially feels like a large toothbrush with very stiff bristles. It worked well to clean out the fine screen on my juicer. This 7” Toothbrush Style Utility Brush with Nylon Bristles has been great for getting the hard to reach places clean. I have even scrubbed the microwave vents and saw much success. I highly recommend to anyone as it is the perfect size and fits in any cleaning cart. More bulk purchasing options please. ACS 7 1/4" scrubble toothbrush style utility brush with nylon bristles. This is also a great cleaning tool for kitchen utensils or blenders. Anything you need to get into small crevices these are the types of cleaning instruments to ge! I use this brush for a multitude of cleaning situations but especially for baking pans in the corners and edges they work great and at a very good price from WEBstaurantStore. Nylon bristled for many detailed cleaning task. We use this to get in to harder to reach areas that we still want to make sure are cleaned well. I purchased he ACS B861 7 1/4" Scrubble Toothbrush Style Utility Brush with Nylon Bristles for home use. The quality is pretty good as well as the price. I used it on my sink and did a really good job. Definitely recommend. This nylon bristle brush is perfect for cleaning or scrubbing most surfaces. The bristles are stiff but wont scratch like metal bristles. The price is right on too! I absolutely love this product! This toothbrush style utility brush works great! Gets the hard to get spots. I like to use it for the edges of the sinks and faucets! This is very well made cheap brush you could use for all sorts of things. I personally use it for cleaning the inside of non-stick pans around the rivets so that it doesn't scratch. Sir Clean Miami recommended ACS B861 7 1/4" Scrubble Toothbrush Style Utility Brush with Nylon Bristles, because its great for clean tiny areas and the material is durable. Good Price! This brush is great for cleaning in the kitchen around the faucets and back areas of the stove where a large sponge is hard to reach. This utility brush may look like a toothbrush but it is not something you'd want to use on your teeth. It is sturdy and the bristles stay stiff. It's a great buy! I LOVE THIS TOOTHBRUSH, ITS VERY PRACTICALLY, ERGONOMIC, RESISTANT, DURABLE AND EASY TO USE. IT LOOKS GREATE IN YOU KITCHEN. IF YOU HAVE THE OPPORTUNITY BUY IT. 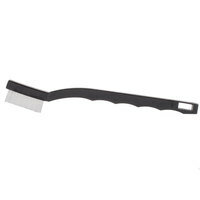 This 7 1/4" scrubbie toothbrush style utility brush has nylon bristles. This isn't meant for cleaning items that are hot, I like to use this to fine tune our refrigerator grates. The ACS B861 7 1/4" Scrubble Toothbrush Style Utility Brush with Nylon Bristles can also be used to clean dirt out of nails. So many uses for this brush. Arrived very fast. Good purchase. This is a nice brush to get into those little spaces when cleaning. The bristles are firm but they do not scratch the surfaces we are cleaning. I purchased this brush specifically for cleaning tile grout. The 1/2" size and nylon bristles are ideal for this application. The bristles do not leave marks on the tile (the nylon material is soft - but definitely tough enough for scrubbing). This is a very handy brush to have around. The nylon bristles clean the surfaces gently and do not damage the material. I use this nylon brush to clean the kitchen countertops from small particles.